New Delhi: Time was when the Yamuna was a revered river and people from far and near gathered to take a dip in its waters, in Delhi, on every celestial event and festival. The French traveller, Francois Bernier, who witnessed a solar eclipse here in 1666, notes: “I took my station on the terrace of my house, situated on the banks of the Gemna, when I saw both shores of the river, for nearly a league (5.6 km) in length, covered with gentiles or idolaters, who stood in the water up to the waist”. Such scenes were witnessed on the banks of all major rivers across north India on Monday, barring the Yamuna in Delhi. The polluted river was bereft of devotees taking a holy dip to mark the beginning of the harvest season. Even the administration made no arrangements for devotees, not expecting any to turn up to bathe in the dirty waters. The 22km stretch of the river through Delhi is practically a sewer. Excluding the monsoon months, the river is completely deprived of a fresh water flow and creeps towards Uttar Pradesh carrying only Delhi’s waste. So far, Rs 4,439 crore has been spent on cleaning the river but other than its worsening water quality, nothing has changed. The New Delhi Municipal Committee and the erstwhile Municipal Corporation of Delhi have spent an additional Rs 315 crore for river cleaning work that includes creation of toilets and cleaning of drains. 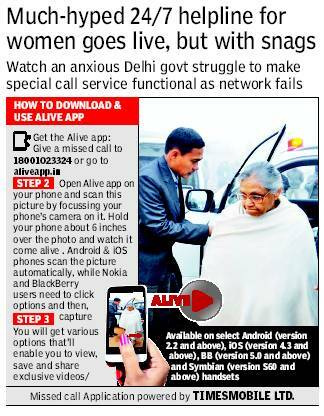 UP and Delhi have also recently been pulled up by the Supreme Court on their ineffective work. Central Pollution Control Board has been monitoring the water quality of the river, including the working of sewage treatment plants and effluent treatment plants in Delhi. In court, it revealed that the installed sewage treatment capacity in Delhi is 2,460 million litres per day against sewage generation of 3,800 mld. Only about 63% of the installed capacity is being used as several areas lack a sewer network, many drains are blocked and some STPs do not function to capacity. With 1,360 mld of sewage flowing into the river untreated, the effort to treat the remaining sewage has come to naught. 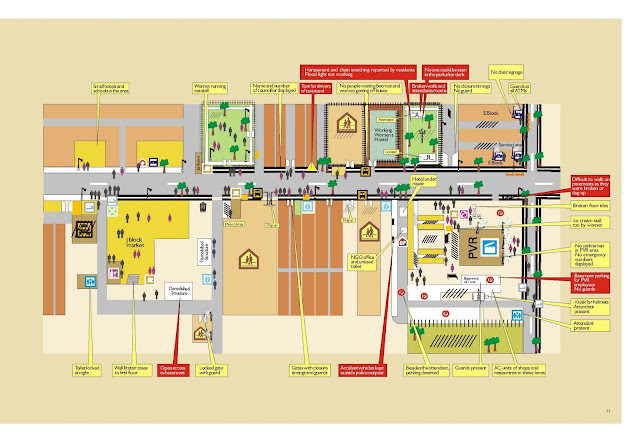 Delhi Jal Board has launched an ambitious project to solve the problem. The interceptor sewage system entails laying of parallel drains along Delhi’s three main drains, Shahdara, Supplementary and Najafgarh. These drains will trap all sewage falling into the drains, take it to STPs and carry treated sewage back to the drain. Work on these will take another two to three years. However, even this will not be able to bring the pollution down to levels where the water can be categorized as ‘bathing quality’. CPCB officials say dissolved oxygen (DO), a measure of the “amount of oxygen available in dissolved form in water” is necessary to support aquatic life. If it drops below a certain level, life forms, specifically fish, are unable to continue living. Downstream of Khajoori Paltoon Pul, the point where the Najafgarh drain meets the river, DO is down to zero. Microbial levels are also very high by the time the water reaches Okhla Bridge. In November 2012, when the city was in the throes of its worst smog spell in recent years, PM2.5 levels were consistently over 500 mg/cu m over several places. “Beijing undertook several measures to control its air pollution levels during the Beijing Olympics in 2008 but the city is still prone to smog. More recently, it has decided to implement a lottery system for private cars which it hopes will keep a check on the rising number of vehicles,” said Anumita Roychowdhury, associate director at the Centre for Science and Environment. Experts say that smaller the particulate matter, the more likely it is to affect human health. Between PM10 and PM2.5, the thicker particles are most likely to be natural while smaller ones are a result of activities such as combustion. This is why, claim environmentalists, vehicles are considered a major contributor to PM2.5 levels. The two most likely reasons for high levels of PM2.5 at present are vehicular emissions and biomass burning. 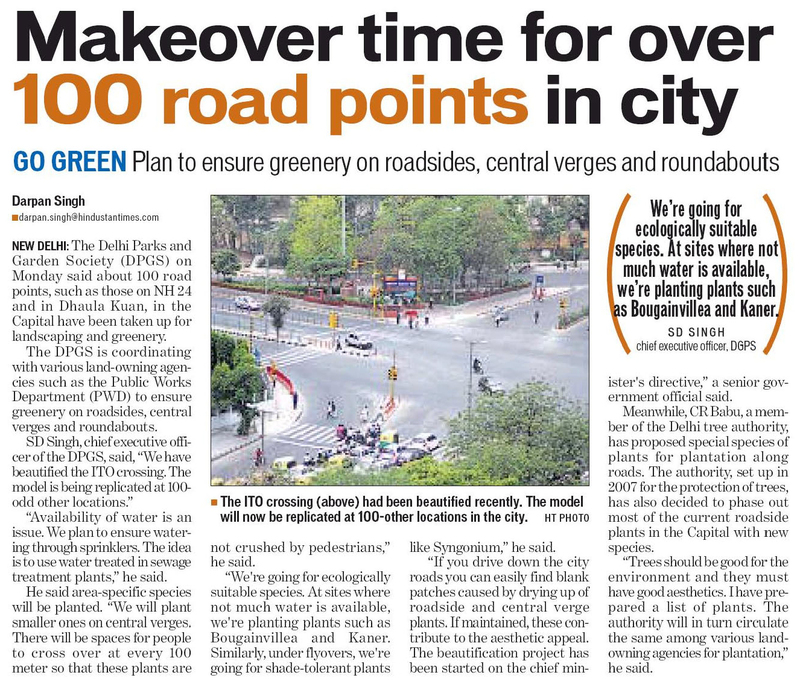 Realizing the urgent need to tackle the city’s deteriorating air quality, Delhi’s environment department, with the help of other agencies, has drawn up a master plan. However, while it is still to be cleared by the cabinet, all good intentions are being wasted. 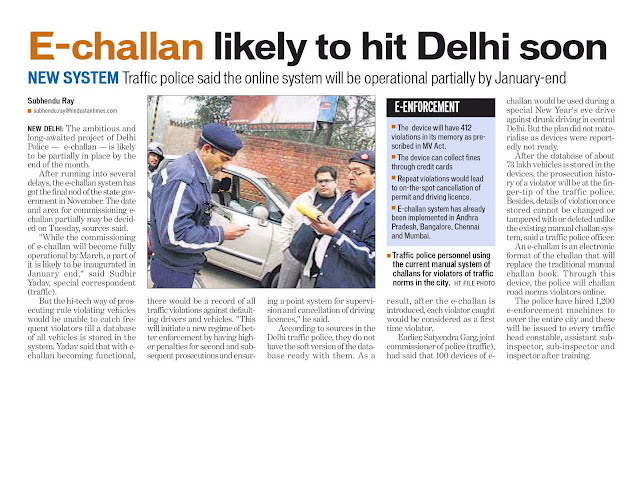 The city’s biggest worry is its fleet of over 74 lakh vehicles to which about 1,700 are added each day. New Delhi: Beijing’s air pollution made international news over the weekend when fine particulate matter (PM2.5) in the city air rose to an ‘out-of-index’ level of 755 mg/cu m. Pictures showed Beijing residents wearing masks amid advisories that they should stay indoors. Meanwhile, it was business as usual in Delhi on Monday when despite a clear windy day, the PM2.5 levels ranged from 130 to 565 mg/cu m.
cu m. The Indian standard for this pollutant — that can cause respiratory illnesses and worsen heart ailments — is 60 mg/cu m.
On Monday, the highest value of 565 mg/cu m — considered very hazardous — was recorded at R K Puram for about two hours. But even the lowest reading at this site was 191 mg/cu m, more than three times the Indian standard. New Delhi: Delhi’s draft policy on water has a strong focus on demand management, suggesting that per capita consumption in the city should decrease from the present average of 172 litres per capital per day (lpcd) by a minimum of 10 litres each decade. With limited fresh water sources, the capital also needs to shift focus to recycling and reuse of waste water and curtailing distribution losses. Delhi Jal Board’s 12th Five Year Plan Approach Paper has projected a demand of 1,140 million gallons per day by 2017 for a projected population of 190 million. The report prepared by Intach and still in the discussion stage says DJB is currently supplying 822 MGD of water which is an average of 220 lpcd. However, the supply is highly inequitable with Delhi Cantt getting 509 lpcd, NDMC areas being supplied 440 lpcd and outer Delhi areas getting as little as 40 lpcd. Delhi also has an extremely high level of non-revenue water which includes that lost en route to distribution points and that which is either stolen or supplied to areas that are not metered. The National Water Policy has directed that an acceptable figure of losses is 15%. Shifting focus from supply to demand will entail reduction in present per capita consumption. 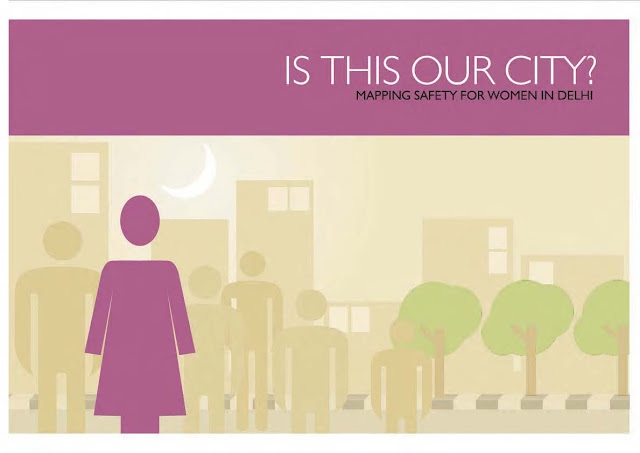 The Intach report suggests that Delhi should reduce its per capita consumption of 172 lpcd by a minimum of 10 litres every decade. The possible additions to Delhi’s supply are Munak Canal which will supply 80 MGD and Renuka Dam which, if commissioned in part, will supply 150 MGD and, if fully, an additional 275 MGD. Two other dams that could increase Delhi’s supply are Kishau and Lakhway Vyasi with 372 MGD and 185 MGD, respectively. However, keeping in mind changing climatic conditions, increase in demandand the fact that Delhi is a riparian state in water sharing agreements, it needs to increase its dependency on recycled water resources. The report suggests that recycled water should form 25% of supply by 2017, 50% by 2022 and a minimum of 80% by 2027. DJB CEO Debashree Mukherjee said that one way of reducing demand is by increasing tariff. “For that we are looking at volumetric tariff and full metering by 2020. People should know how much they consume and what they should pay for their consumption. Secondly, awareness building is also our prime focus,” she said. It is essential to increase availability of water by controlling distribution losses. A maximum permissible loss of only 10% should be permitted by 2025. Delhi’s dependency on ground water also needs to be reduced, especially since its level across the city has dropped to alarmingly low levels. The policy advocates passing of the ground water bill that will give the state more control on ground water resources. It says that aquifer exploitation should be neutralized by 2020 and attain full recovery to 1990 levels by 2030. A Water Resources Commission will be set up. 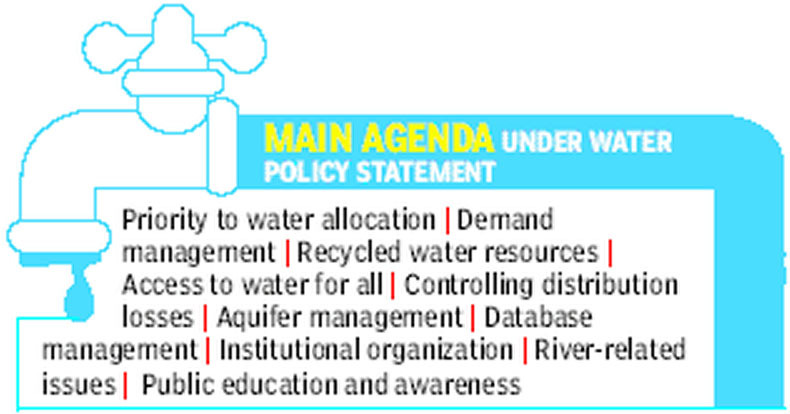 Its mandate will be to deal with the regulatory aspects of water and monitoring of policies. The commission would “coordinate the actions of all agencies involved with water services, resource management, river issues, foster technological and administrative and financial innovations, track developments in the northern river basins, track climate change impacts on resources, benchmark performance on policy parameters and act as a pricing regulator”. 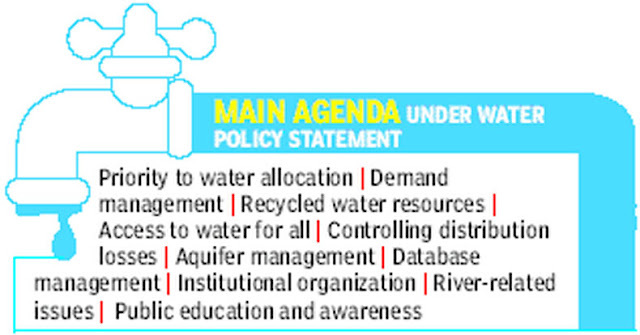 A strong focus of the policy is also on development and maintenance of water bodies and river Yamuna. Water quality of the river needs to be improved to bathing quality by 2020.